A local authority has made more than £440,000 from the sale of artworks which critics say will be “lost to the public forever”. Hertfordshire County Council is selling items from its collection which it said had “little relevance to the county”. Opponents of the sale wanted the “significant body of art” put in a trust. 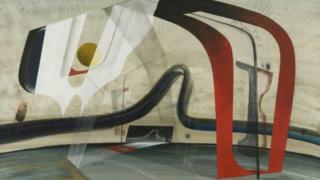 John Tunnard’s Brandis proved to be the biggest draw on the first day of auctions, selling for £37,000. A pastel by Joan Eardley sold for £31,000, as did Anne Redpath’s Blue Plate. A 20% buyer’s premium will be added to the hammer prices. Conservative councillor Terry Douris said the decision to dispose of much of the collection was “the sensible thing to do” as 60% of it was “languishing in storage and not available to the public”.